The two freight ferries that serve the Northern Isles have been bought by the Scottish government. 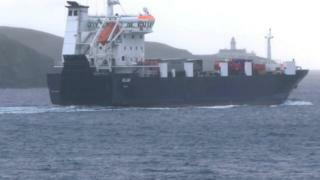 The MV Helliar and MV Hildasay operate between Aberdeen, Kirkwall and Lerwick. Previously chartered, they will now join the Caledonian Maritime Assets Ltd (CMAL) fleet. Paul Wheelhouse, Minister for Energy, Connectivity and the Islands, said the deal would bring financial benefits by delivering long-term savings to the public purse. He said: "Our ferry services are iconic transport links that play a vital role for our island economies, so it's important that we secure the two freight ferries for the future. "Making sure these lifeline transport links continue to support the communities and businesses they serve and deliver best value for taxpayer's money remains at the heart of our ferry operations." CMAL chief executive Kevin Hobbs said: "This deal secures the future of the freight ferries, strengthening lifeline ferry provision for Orkney and Shetland." The figure involved has not been revealed.